The Basilica di Santo Spirito in Florence has opened its cloister to the public for the first time. The cloister of the former monastery and convent was a space that connected different parts of the complex, such as the basilica and the dining hall, that the monks who lived there used daily. It comprises two refectories and a sacristy. To enter the cloister from the basilica square, go through the door to the left of the church – but stop to admire the door itself, which was built in 1620 by architects Giulio Parigi and Alfonso Parigi il Giovane. The building’s arched walls frame a peaceful inner courtyard that has a garden, pond, and fountain. On the walls surrounding the courtyard are gravestones dating back to the monastery’s founding – some of which are in very old Gothic lettering – that lend the cloister its name, Chiostro dei Morti (Cloister of the Dead). Above the tombstones, restored frescoes illustrate St. Augustine’s life. In the main refectory, visitors can view a frescoed version of The Last Supper as painted by Bernardo Poccetti, in 1597. The painting, restored in 2013, depicts three dinner scenes: the Marriage at Cana, the Last Supper, and the Dinner at Emmaus. 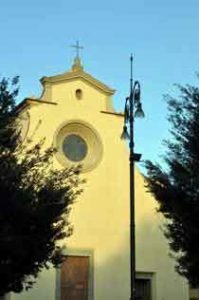 The “new refectory” is a small meeting room, but the church’s priest, Don Giuseppe, told ArtTrav he is considering hosting concerts there. Michelangelo’s Crucifix hangs in the middle of the sacristy thanks to a donation from the American nonprofit Friends of Florence, which paid for its installation. The Santo Spirito complex was built by Augustinian monks in the later part of the 13th century; the church, designed by Brunelleschi, was constructed in 1481 and the cloister was added in 1600. Entry to the basilica is free, but entry to the cloister is 3€. Closed Wednesday. Guided tours are available on weekends.